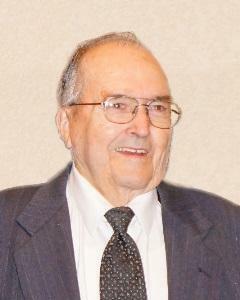 Roy G. Howk, 92, of Glencoe, died Monday, Nov. 14, 2016, at his home. Funeral services were held Saturday, Nov. 19, at the Apostolic Christian Church in Winthrop with the church ministers presiding. Music was by the Apostolic Christian Church choir. Casket bearers were Mr. Howk’s granddaughters, Rose Lendt, Jamie Engel, Kim Moore, Kjerstin McKeehen, Britney Hay, Andrea Stover, Kayla Howk-Erwin, Cynthia Howk, Chelsey Rice, Ashleigh Remme and AmberRose Brudelie. Interment was in the Winthrop Cemetery in Winthrop. Roy G. Howk was born May 26, 1924, at his home in Brownton, the son of Ray and Elsie (Clopton) Howk. He received his education at a country school in Winthrop. On May 14, 1944, he was united in marriage to Rose Alice Messner in Lafayette. They were baptized in 1961 at the Apostolic Christian Church in Winthrop. They made their home in Glencoe, and were blessed with seven children, Kenneth, Steve, Sharon, Iris, Karen, Keith and Colleen. They shared 58 years of marriage before Mrs. Howk’s death on May 15, 2002. Mr. Howk worked at Green Giant as a farm supervisor for 36 years, retiring in 1999. He was a member of the Apostolic Christian Church in Winthrop, where he had been an usher and ran the sound system. He enjoyed woodworking, camping and playing dominoes with his family. He especially enjoyed watching the grandchildren grow up and spending time in fellowship with family and friends. He is survived by his children, Steve (Linda) Howk of Springfield, Illinois, Sharon (Dennis) Christensen of Glencoe, Iris (Ronald) Hay of Revillo, South Dakota, Karen Smith of Glencoe, Keith (Paulene) Howk of Monument, Colorado, and Colleen (Wayne) Waugh of Owatonna; daughter-in-law, Lupy Howk of New Ulm; 20 grandchildren, Rose (Allen) Lendt, Michael (Sheila) Howk, Kayla (Patrick) Howk-Erwin, Cynthia Howk, Andrew (Nikina) Howk, Brian (Rhonda) Howk, Jamie (David) Engel, Eric Howk, Doug Christensen, Kim (Rick) Moore, Chad (Tonya) Christensen, Nathan Hay, Britney Hay and her fiancé, Jeremiah Peterson, Ashleigh (Shawn) Romme, Kjerstin (Ron) McKeehen, Andrea (Nick) Stover, Chelsey (Steve) Rice, Corey Howk, AmberRose (Michael) Brudelie and Wade Waugh; honorary granddaughter, Kenadee Isaacson; 38 great-grandchildren; two great-great-grandchildren; sister, Carol (Dennis) Pollock of Albuquerque, New Mexico; brothers-in-law and sisters-in-law, Georgia Messner of Winthrop, Elaine Rettig of Waconia and Marlyn (Lois) Messner of Winthrop; nieces, nephews, other relatives and many friends. He was preceded in death by his parents, Ray and Elsie Howk; wife, Rose Alice Howk; son, Kenneth Howk; grandson-in-law, Robert Fuglsang; great-great-grandson, Aydden Forcier; brother and sister-in-law, Russel and Evelyn Howk; sister, Ruth Ann Howk; brothers-in-law and sisters-in-law, Amos Messner, Avice and Wilmer Lehrke, Delores and Cornelius Messerli, Roland and Melva Messner, Leo Messner and Ray Rettig.